Does your neck ache at the end of the day, or feel stiff as a board when waking up in the morning? Different types of neck pain, can tell you what the underlying problem is. Neck pain is incredibly common. In fact, an estimated eight out of ten adults will experience neck pain at some point in their life. The reasons as to why you may develop neck pain are about endless. For some, neck pain is the result of poor posture, while for others neck pain can be the direct result of a car crash or other injury that causes the neck to jolt quickly, the experience otherwise known as whiplash. Sometimes neck pain is short lived. After sleeping on your neck poorly, or after carrying something that is exceptionally heavy there is a chance that you will develop neck pain that will hurt for a day or two, but will gradually start to get better until it is entirely gone after a period of days or maybe weeks. But then there is chronic neck pain. Chronic neck pain is pain that develops in the neck, frequently as a result of injury, but doesn’t go away. 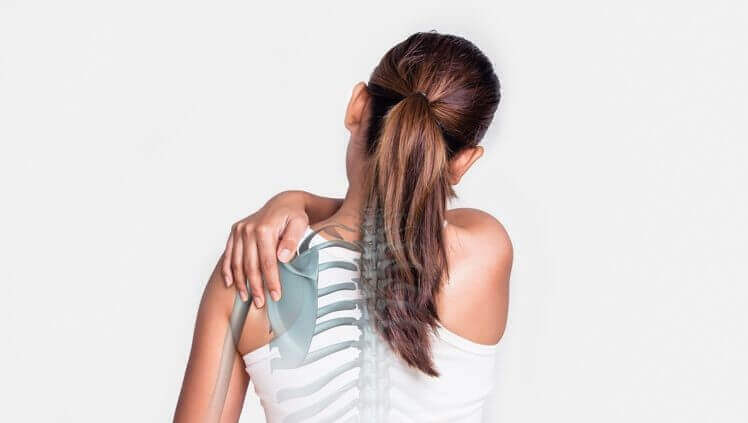 As is the case with most issues of chronic pain, the resulting, lingering pain that follows you around indefinitely is often more frustrating and in some cases even more downright painful than the experience of the injury itself. Your neck needs to be supported during the night. Never sleep on your stomach, as this causes excessive strain on the neck muscles and joints, making symptoms worse. Sleep on your back or side. When sleeping on your back you might need to use two pillows, layered in a way that the bottom pillow supports your shoulders, while the upper pillow is overlapped and supporting your neck. For sleeping on your side, have a thick enough pillow or use two, so that the pillow is tucked all the way to the shoulders supporting the neck. Be careful as to how you hold your posture throughout the day. Working at a computer, or spending prolonged time on a phone with a forward head posture, can put up to 40lbs of stress on your neck over hours! When looking at your smartphone or tablet, try to bring the screen closer up in front of your face, rather than look down. In addition, when working at a computer, make sure the monitor is high enough so that the top 1/3rd of the screen is eye level. When sitting, try to use a small rolled up towel in the small of your back to sit tall. Avoid slouching on couches or in a chair. Be comfortably tall when sitting. Most pain to the neck is cause by stiffness in the upper neck and upper back, causing abnormal strain to the mid neck. The goal is to increase the mobility of these areas, to alleviate strain and restore natural movement to the whole neck and shoulder area. In sitting, keeping your neck relaxed, gently bring your shoulder blades back and together. Don’t hunch up your shoulders. Do this action smoothly and slowly. Repeat 10 times and do multiple times a day to loosen your neck. Stand with your back against a wall with good posture. Keep looking forward, then gently try to press the back of your head towards the wall. Don’t worry if you can’t touch the wall with your head, just keep your eyes and chin level. Feel a gentle stretch in the neck, but don’t press hard. Hold for 5 seconds and perform 10 of them 2-3 times a day. As a general rule, acute neck pain is easier to address than is chronic neck pain. However, without proper treatment and intervention, acute neck pain can become a chronic problem. It is a good idea to meet with a physical therapist and to go over the ideal ways to address neck pain before making any attempts to alleviate neck pain on your own. The wrong type of exercise or a bit too much stress on your neck while it is already vulnerable can cause you to develop a more severe injury, and this could cause your neck pain to become chronic—meaning it won’t go away. Neck pain is considered chronic when it has refused to lessen, despite attempted intervention, following a prolonged period of time. Self-care is still an option when addressing chronic neck pain, and taking precautions like reducing the burden on your neck by sitting more often, using improved posture and trying others of the home-remedies listed above like muscle stretching and hot-cold therapy may work to some extent, but you will need physician support to fully address this level of pain and to ensure that you do not cause yourself any further injury. Before you attempt any treatment for neck pain it is important that you meet with your doctor of physical therapy, and that you understand exactly what the cause of your pain is. Pain from a sprain or a tear in a ligament is going to require very different treatment from pain as a result of tension or tightened muscles. Working with your physical therapist with hands-on treatment and specific PT exercises to address the source of your chronic pain can help you live pain free, but only if those physical therapy exercises are done right. Before attempting any stretching or mobility exercises on your own, make sure that you consult with your physical therapist for guidance and support.